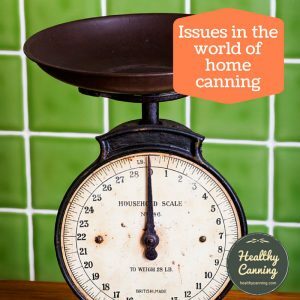 Hard water can cause two issues in canning, though neither of them is a safety issue, thankfully. 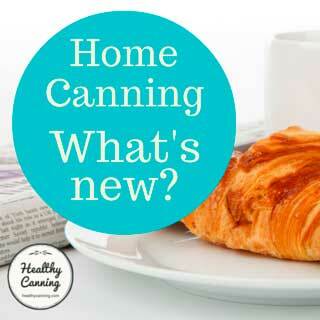 Minerals in the hard water can cause build-up on the insides of the canner and clouding on the outsides of the jars. 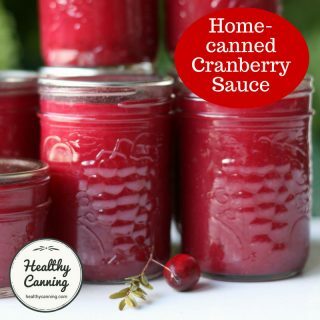 Overtime, this can even happen with “normal water.” A few tablespoons of vinegar in the water during processing can usually avert this problem. 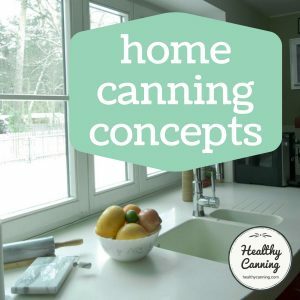 Any built-up deposits already in the canner could be tackled with a cleaning solution such as CLR, etc. 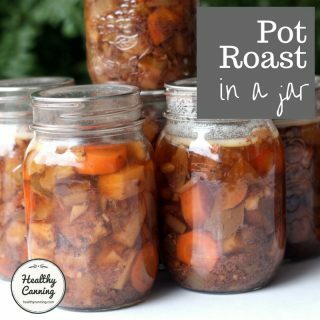 As for build-up on jars, “This scale or hard-water film on jars is easily removed by soaking jars several hours in a solution containing 1 cup of vinegar (5 percent acidity) per gallon of water prior to washing and preheating the jars.”  United States Department of Agriculture (USDA). 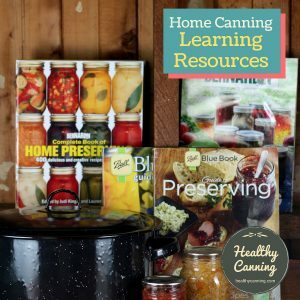 Complete guide to home canning. Agriculture information bulletin No. 539. 2015. Page 1-14. In pickling, hard water (specifically, the minerals in it) can cause the pickling solution to be cloudy, and the pickles to discolour. Ball says, “Soft water must be used to make pickling brine. Minerals in hard water will have a negative effect on the quality of pickles.” Ball Blue Book. Muncie, Indiana: Healthmark LLC / Jarden Home Brands. Edition 37. 2014. Page 72. This is not a safety issue; it’s a “quality” or rather more precisely a “visual quality” issue. You can check for hardness by shaking a small amount of soap—not detergent—in a jar of water: if it makes a good head of suds in your water, hardness is not a problem. Or ask your municipal water department to tell you the composition of the water that comes from your tap. In rural areas, your health officer can tell you how to have your private water supply tested for mineral content as well as for bacterial count.”  Hertzberg, Ruth; Greene, Janet; Vaughan, Beatrice (2010-05-25). Putting Food By: Fifth Edition (p. 29). Penguin Publishing Group. Kindle Edition. 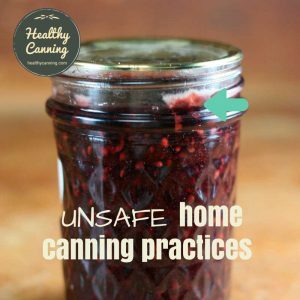 Note: Healthy Canning occasionally cites Putting Food By. This doesn’t constitute an endorsement of the entire book per se. If soft tap water is not available, water can be softened by being boiled for 15 minutes, then allowed to stand for 24 hours. A scum will likely appear on the top of the water; remove the scum before using. Ladle water from the container, being careful not to disturb any sediment that settled to the bottom. Distilled water can also be used for pickling.” Ball Blue Book. Edition 37. 2014. Page 72. 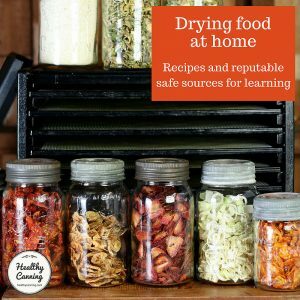 Where there’s no dangerous air pollution (‘acid rain,’ etc): if your water is hard, and you can’t get distilled water, collect rainwater in the open—not as run-off from dusty roofs—and strain it through layers of cheesecloth. Or if you know that hardness is caused by calcium or magnesium carbonates, boil the water for 20 to 30 minutes to settle out the mineral salts; then pour off and save the relatively soft water, taking care not to disturb the sediment. 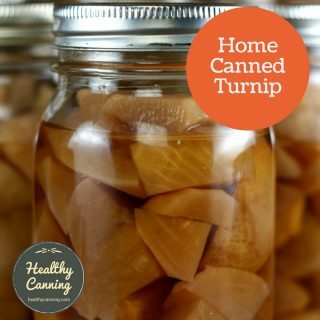 If you plan to make pickles with whole small cucumbers, another means of dealing with very hard water is to boil it for 15 minutes, then let it stand carefully covered for 24 hours; remove the expected light film of scum from the top, and do not disturb the sediment. Pour off the water carefully into a clean, large container, again not disturbing the sediment; add 1 tablespoon white vinegar for each gallon of boiled water before you use it. 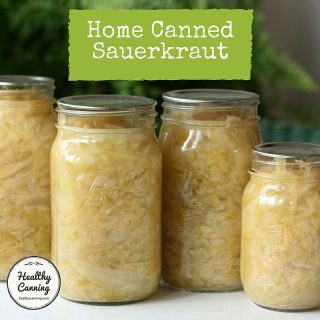 Or add ½ cup vinegar to each 1 gallon of water, so the acid will cause precipitation of calcium and other minerals; then pour off the treated water, as above.”  Hertzberg, Ruth et al. Putting Food By. Page 29. 1. ↑ United States Department of Agriculture (USDA). 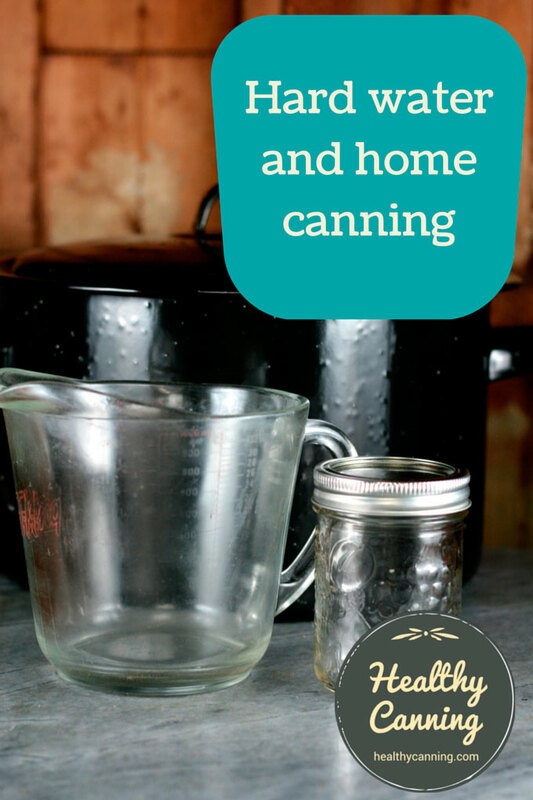 Complete guide to home canning. Agriculture information bulletin No. 539. 2015. Page 1-14. 2. ↑ Ball Blue Book. Muncie, Indiana: Healthmark LLC / Jarden Home Brands. Edition 37. 2014. Page 72. 3. ↑ Hertzberg, Ruth; Greene, Janet; Vaughan, Beatrice (2010-05-25). Putting Food By: Fifth Edition (p. 29). Penguin Publishing Group. Kindle Edition. 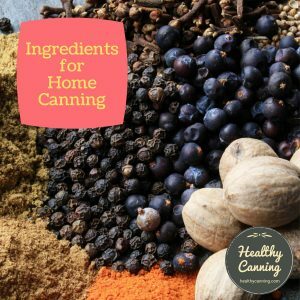 Note: Healthy Canning occasionally cites Putting Food By. This doesn’t constitute an endorsement of the entire book per se. 4. ↑ Ball Blue Book. Edition 37. 2014. Page 72. 5. ↑ Hertzberg, Ruth et al. Putting Food By. Page 29. That would be the hard water on the outside of the jars and on the lid. 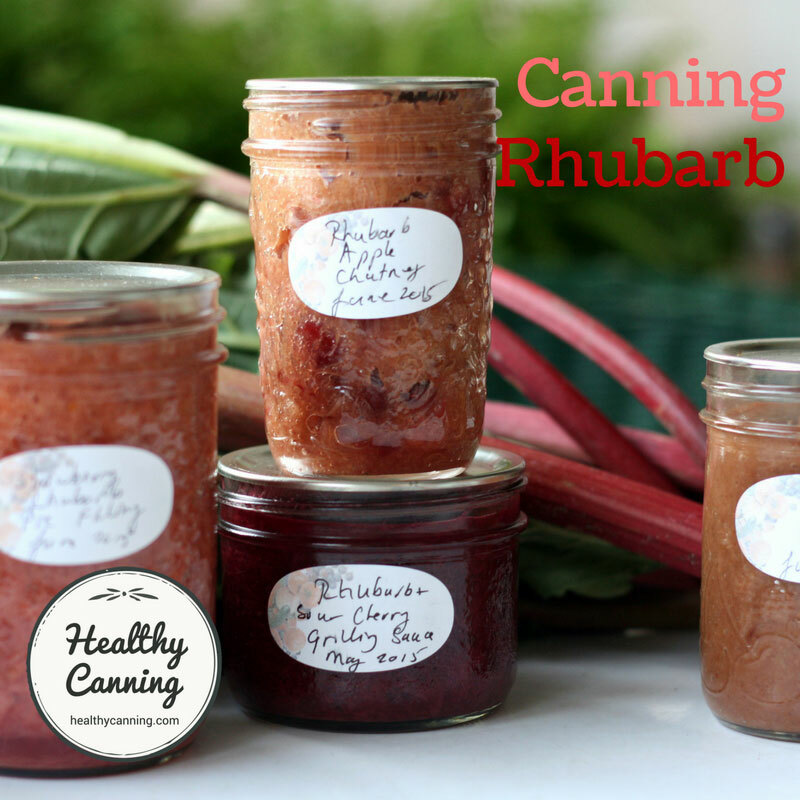 It won’t affect the product inside the jars. You can clean it off with a cloth dipped in water and vinegar. 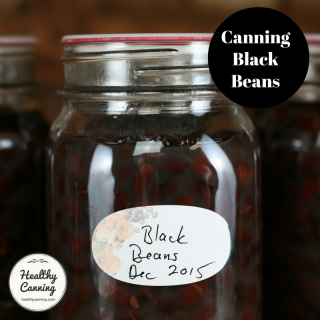 To avoid that in the future, put a few tbsp of vinegar in the canning water.